Residents of the Santa Clarita area can rely on us to fix all of your pipe problems, in the shortest possible time, and at the most affordable rates. We have the latest technology in sewer repair, cleaning, and replacement methods. The trenchless pipe lining technology is the new way of repairing pipes and it has grown in popularity over the past few years. If you have a cracked or worn out pipe, we can replace it with no one even noticing we are there. All we need is to use your sewer’s entry and exit points, but if it doesn’t already have them, we might need to dig only two small holes. What allows our technicians to repair your pipes without digging is the new revolutionary pipe lining technology. It uses complex chemical reactions to create a mass, which we insert into your old pipe with a plastic sleeve. We clean the old pipe of all debris with our Hydro Jetting method. After hydro jetting, the technician inflates a sleeve until it presses the chemical mass up against the pipe’s internal walls, lining it. After the mass hardens we remove the sleeve, leaving a new pipe inside your old one. Our technicians will do this entire operation through your existing sewer openings, or if it is necessary only dig for small entry or exit points. The traditional method would still require much more digging. A good alternative to the pipelining option is Trenchless Pipe Replacement. In this method we insert a new pipe into your old one using a high power drill, which penetrates your old pipe like a snake, guiding the new one in. We will first use our state-of-the-art equipment to diagnose your problem and our experts will advise you on the best course of action. For diagnostics, we use a remotely operated waterproof camera. You view a live feed of the problem together with our experts. We at the Rooter Drain Expert always make sure our clients have a full picture of their problems, and we always offer the best possible solution, making sure it is efficient and affordable. We are a family owned sewer cleaning and repair company, and we have a 100% success rate. 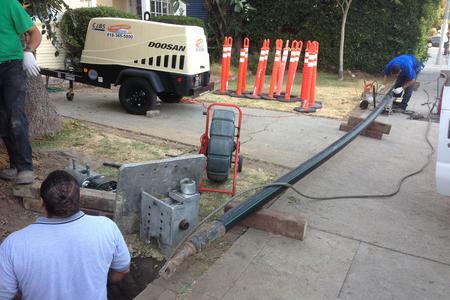 We’ve been serving the people of Los Angeles County for years now, and our experience together with our dedication and cutting-edge technology gives you the best possible solution for all your sewer problems.